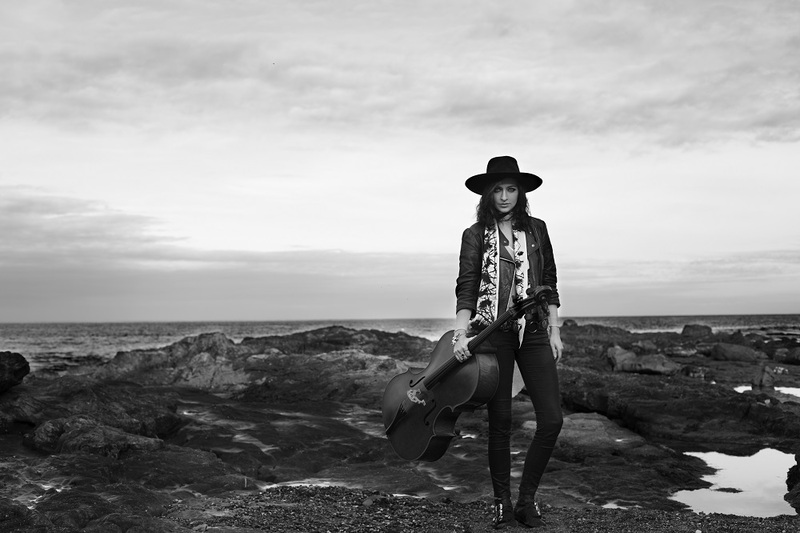 Alana Henderson is a cellist and singer-songwriter from County Tyrone in Northern Ireland who has played over 300 headline shows with Hozier’s band. Her new single, ‘Let This Remain’ is an anti-ballad, fusing an electronic undercurrent to her darkly-organic indie-folk. We found out more about Alana and her music. I like to write as honestly as I can about anything that moves me. I grew up in Northern Ireland surrounded by folk & traditional Irish music. My whole family is very musical. My sister plays piano and harp and is a music teacher, and my brother plays Uilleann pipes and is also a singer and multi-instrumentalist. I played traditional Irish flute and sang from an early age. I started learning classical cello at secondary school and played in Orchestras. When I was 18 I heard the Arthur Russell song ‘A Little Lost’ for the first time. It’s a beautiful song on cello and vocals and it inspired me to start writing lyrics and experiment with using the cello as an accompaniment instrument. Were there any particular bands or artists you took inspiration from to form your solo musical and thematic style? Arthur Russell was a huge inspiration, as he was the first cello-singer I had ever encountered. I was really into the bluegrass band ‘Crooked Still’. When I was a teenager they had a cello-player called Rushad Eggleston who’s choppy experimental style had a huge impact on my playing. We’ve become good friends over the years and I still class him as one of my musical heroes. Its been referred to as ‘folk-noir’ before and I thought that was pretty close to the mark. My own experiences. I like to write as honestly as I can about anything that moves me. There are, of course, elements of artistic-license and fiction in my songs too, but the core lyrics are usually from my own life. I think people can tell whether something is genuine or not. You are Hozier’s long time cello player and backing vocalist. How did you first meet Hozier and get involved with his music? About a year before he broke out with ‘Take Me To Church” I was asked to open for Hozier at the Limelight venue in Belfast. I wasn’t available to do the gig so I sent an email to apologise and wished him luck with the show. I checked out his EP online and I was blown away by it. It was about a year and a half later that I got a call from someone at his label. They were seeking a cellist who also sang and someone had remembered me. Ireland is a small country and sometimes that works in it’s favour! What is it like working with Hozier? Andrew is an artist who I greatly admire and respect. Those few years of touring were a real pleasure because I loved the music we were performing. We’ve got some similar points of reference in the world of Irish-folk so that was a nice bit of common ground… we performed a stripped back folk set together at Newport Folk Festival and that was a highlight of the tour for me. Andrew is an exceptional writer and he also has work-ethic to see it through. His success is so deserved and it’s been a pleasure to work alongside him and witness that. Tell us about your new single ‘Let This Remain’. What’s it about? ‘Let this Remain’ is a reflection on relationships. More specifically “casual” ones. Its about the trade-off between emotional detachment for self-preservation and finding actual lasting connection. I wrote it at the end of the two years of fairly relentless touring so I suppose it’s a reflection of the transient relationships associated with touring. I recorded it at a friends secluded cottage in Connemara with the help of Belfast Musician/ Producer Alan Haslam. How does ‘Let This Remain’ they compare to your previous work? It’s a bit of a departure from my previous work, a little darker, more poppy. There’s synth. I hope people like it because there’s more to come! What are your hopes for ‘Let This Remain’? I just hope that people can relate to it. I hope that anyone who liked my previous releases enjoys ‘Let This Remain’ as much and that perhaps it introduces a new audience to my work. I’m working on an album right now so I’ll be laying low for the next few months. I’d say Spring/Summer 2018 is a solid bet! Jesca Hoop. I am a huge fan of her work… she’s such a singular and powerful artist. I’d love to get a glimpse into her creative process. I’d probably go back and tell my 18-year-old self not to bother going to University! I studied Law for 3 years and for all that it was a really great experience and I’m glad to have a degree, I always knew that music was my real passion. I think I’d go back and tell myself to be brave and take that leap 3 years earlier because I was only delaying the inevitable. I could have saved myself a tonne of student debt and had more time to work on music!! Watch ‘Let This Remain’ on YouTube below. For news and tour dates go to alanahenderson.com.